SAN JOSÉ, CA-- Opera San José opened “Secrets Revealed,” as its 29th Season is named, with GEORGES BIZET’s fabulous THE PEARL FISHERS, the ópera in three acts located in Ceylon where superstitious pearl fishers and their families offer hymns and dance exotic dances in honor of the god Brahma, before their yearly diving. They believe that if they act joyful, while a virgin goddess sings from the top of a hill overlooking the ocean when the men search for pearls, that they will be protected. The work with libretto by MICHEL CARRÉ and EUGENE CORMON, was sang in French. It is interesting to mention that when the French composer BIZET, formally called Alexandre César Léopold Bizet, (l838-l875) wrote THE PEARL FISHERS as a request from Count Walewski, originally the story was set in Mexico, but later, it was moved to Ceylon. The ópera Premiere at the Theatre Lyrique in Paris (the best prospect for an aspirant opera composer, and this was BIZET’s first publicly-staged work) on September 30, l863. 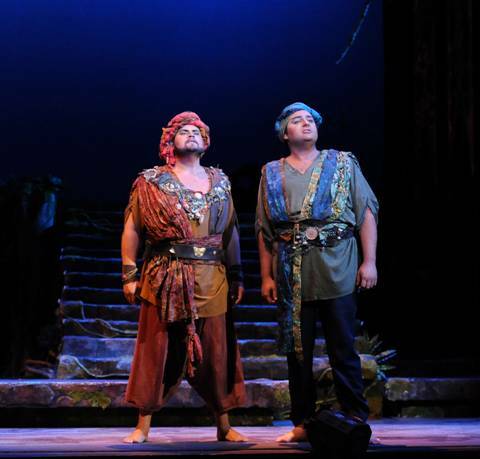 The opera relates the story of two pearl fishermen: Zurga and Nadir. When they were young, the friends visited the temple in Kandi and saw a woman that was so beautiful that both of them fell in love with her. To keep their friendship intact, they decided to stay away from her, but Nadir broke his promise and not only followed the woman, but got to meet her. They fell in love. Years later, Nadir who had been living in the jungle among the wolves, returns to the village the night before the day when the divers go to sea to dive for pearls. Because of it, he sees the goddess the fishermen had hired to sing all night to Brahma (The Hindu God of creation and one of the three gods of the Trimusti, along with Visnu and Siva) to appease the sea. The goddess is Leila, the same woman that once both men fell in love with in the temple of Kandi. Nadir recognizes her by her voice, ( A veil covers her face) and when she is left alone to start singing and praying to Brahma, he approaches her. Nadir is discovered by a High Priest and after a tempest brakes, believing that the reason for the bad weather is that the goddess broke her promise to remain pure, love no man and never uncover her face, both Nadir and Leila are sentenced to death. At the end Zurga discovers that Leila was also the girl who saved his life once, so as king he decides to let them go free. In many versions of the opera, Zurga remains alive but in OSJ version, Zurga is killed after setting the camp on fire. The cast who sang the four principal roles on opening night (OSJ uses two different casts for each opera) was stupendous. The role of Leila was sung by soprano CECILIA VIOLETA LOPEZ, (pictured left). 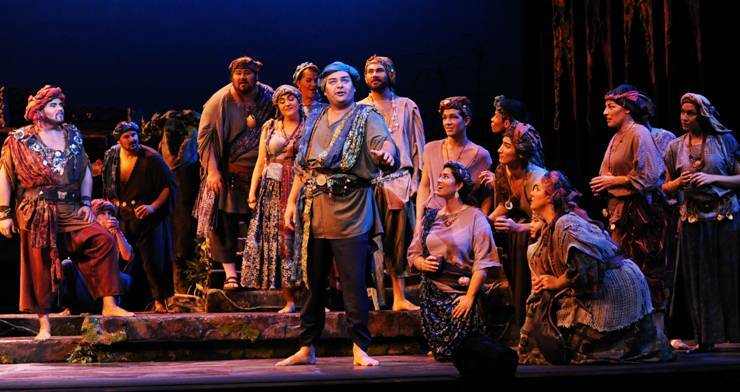 The role of Zurga the pearl fishers’ king, by baritone EVAN BRUMMEL. The role of Nadir, by tenor ALEXANDER BOYER and the role of Nourabad, the high priest, by SILAS ELASH. to interpret because one characteristic of Bizet, who was a student of Gounod, is that he uses melodic clarity in his operas. Bizet’s melodies also represent the actions of the singers and their moods. There are boisterous sounds in the religious dances in Act I, severity of melodies accompanying the Brahma ceremonial. And at the end the somber atmosphere of a funeral march during the preparation of the execution of Leila and Nadir. Interpreting the changes of tempo and volume is difficult. The opera opens with a lively dance, (danced by the student dancers of the Ballet S.J. School LISE La COUR’s La Cademy) as a well-harmonized mix chorus (ANDREW WHITFIELD) sing Sur la grave en Feu in which the singers express that the reason for their dancing and singing is to ask Brahma to keep the sea calm so that the pearl fishermen will be safe the next day when they dive to search for pearls. The musical tempo changes and we hear Amis interrompez vos Danses (Friends interrupt your dances) the aria where Zurga (BRUMMEL) invites the fishermen to elect a king. Shortly after Zurga is elected, Nadir enters the stage and both men meet. 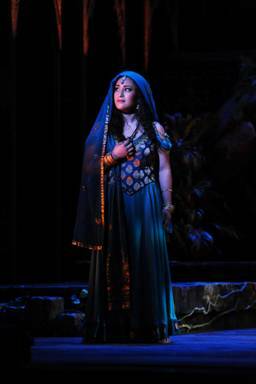 As Leila, soprano CECILIA VIOLETTA LOPEZ enhanced the superb singing of the night with her unique tone of voice and her Bell Canto technique. Her voice has power, yet it is mellow in sound. It has volume yet it could also produce a very soft tone. Above all its sound is completely pure and changes smoothly from the lyrics of her arias to her melismatic passages allowing us to hear her coloratura tones which sounded lovely. Her Me Voilà Seule dans la nuit (in which she expresses her fear of being left alone on the hill overlooking the ocean at night) and her two duets with Nadir (BOYER) in act II were masterfully sang. As a high priest, SILAS ELASH as Nourabad, gave us a powerful Sombres Divinites, at the end. The choir was also powerful. Stage Director RICHARD HARRELL got convincing acting from all the singers, even dramatic acting when needed. The sets of CHARLIE SMITH served their purpose, and combined with the colorful and creative costumes (Elizabeth Poindexer from the 2003 revival) gave the work the feeling of an exotic fairly tale story being presented on the stage. THE PEARL FISHERS will be played (with alternative casts) until September 23.